When Kratos needs a pick-me-up, he heads over to his local 7-Eleven for a Kratos-flavored Slurpee and a Big Bite. 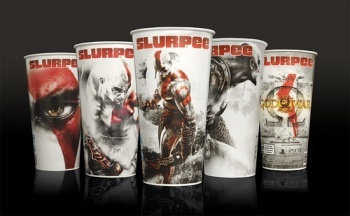 Starting tomorrow, 7-Eleven will begin to sell an exclusive new flavor of Slurpee called "Kratos Fury." That name isn't a coincidence, the new flavor is part of a God of War III marketing campaign that will also include a host of Slurpee cups based on the game. Kratos Fury is a blend of blackberry and lime formulated by Sony and Mountain Dew, which sounds delicious. If only I didn't think Slurpees were a slurry unworthy of my consumption, I'd be more excited about this. Lime and blackberry are much better tasting than blood and rage, which is how fellow Escapist writer Logan Westbrook feels a Kratos Slurpee should taste. Each of the four different God of War III Slurpee cups will provide Slurpee Nation codes that can be redeemed for special DLC. According to the PlayStation Blog, these codes will unlock new Kratos costumes, PlayStation 3 themes, or God of War III behind the scenes content. If you aren't a fan of Slurpees, picking up some Mountain Dew at 7-Eleven will also provide a code that can be used to unlock a Mountain Dew hoodie or God of War III t-shirt in PlayStation Home. Too bad for me, I don't like Mountain Dew either, so I guess I have to miss out on all the fun. I do love myself a good hot dog cooked on a roller machine though. Pop one in a Pandora's Box, and you've got yourself a Dog of War. Make it happen, 7-Eleven.